New Orleans is an incomparable sandwich town; it already boasts both the po' boy and the muffaletta. But there's one lesser-known sandwich that deserves your attention too -- the Peacemaker, dating back to the 19th century. Allegedly named for husbands who would bring them home to waiting spouses as a preemptive apology for any (presumably) questionable behavior, the peacemaker is sufficiently delicious to earn its title. The bread. A po' boy-style French loaf is the classic, although modern takes on the sandwich experiment with others. Mahony's. The modern Magazine Street po' boy shop is well-known for its Peacemaker, about a foot long and stuffed with bacon and cheddar cheese in addition to all those oysters. Acme Oyster Bar. A classic New Orleans oyster joint whose Peacemaker boasts oysters and shrimp, plus a spicy Tabasco mayo that binds it all together. Grand Ferry Tavern. This all-American Williamsburg tavern piles deep-fried East Coast oysters on brioche with a spicy remoulade for a slight twist on the classic. Porchlight. 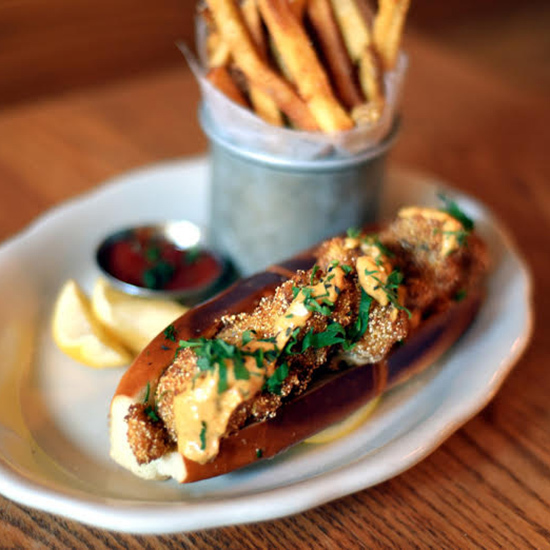 Louisiana-born chef Jean-Paul Bourgeois starts with Leidenheimer French bread, the middle dug out and filled with fried oysters and tomato slices, with dill pickle tartar sauce to finish it off. The logical accompaniment: A bag of Zapp's Potato Chips.